What is the greatest luxury available to the privileged in the twenty first century? Limousine transport? First Class air travel or a private jet? Designer clothes? Exquisite jewellery or the best fine dining? At 7132 Hotel here in Vals, the team believe it is time. Time to relax, unwind, enjoy the view, take the waters. 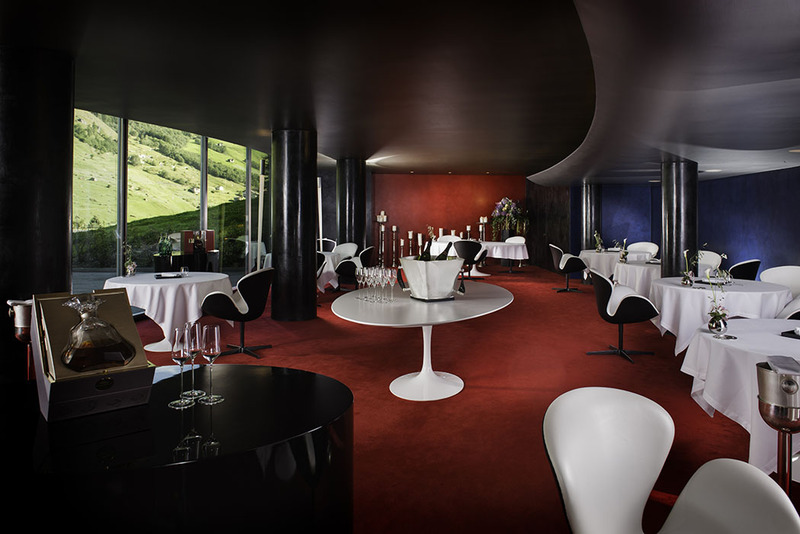 They also offer fine dining of course at Silver Restaurant, recently awarded its first Michelin star. There is also one of the most beautiful spas we have ever seen. They know all about luxury at 7132 in fact. 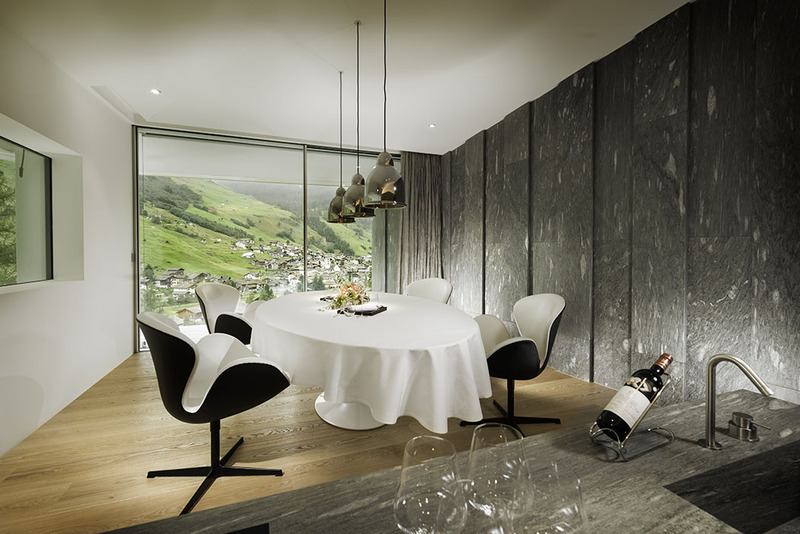 If you book into one of their new suites, the luxury experience begins when the hotel contacts you to arrange your transfer from anywhere within the borders of Switzerland. 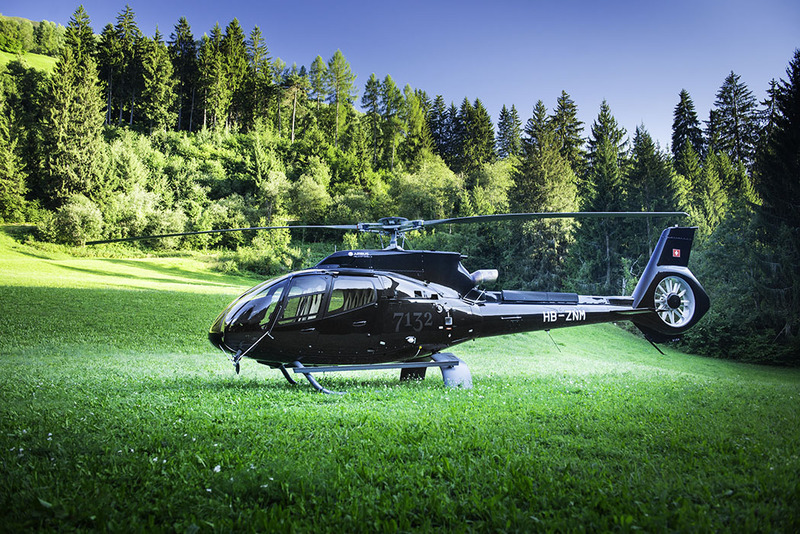 We chose to depart from Basel Airport and were delighted that the weather was perfect for our transfer by helicopter. Yes, you did read that right. A brand spanking new Airbus EC 130 T2, in jet black with the hotel logo discretely displayed on the doors. The views of the mountains and valleys were simply overwhelming, breathtaking. The flight was over all too soon but we were then met at the airfield by a chauffeur driven Mercedes for the short drive into the village. 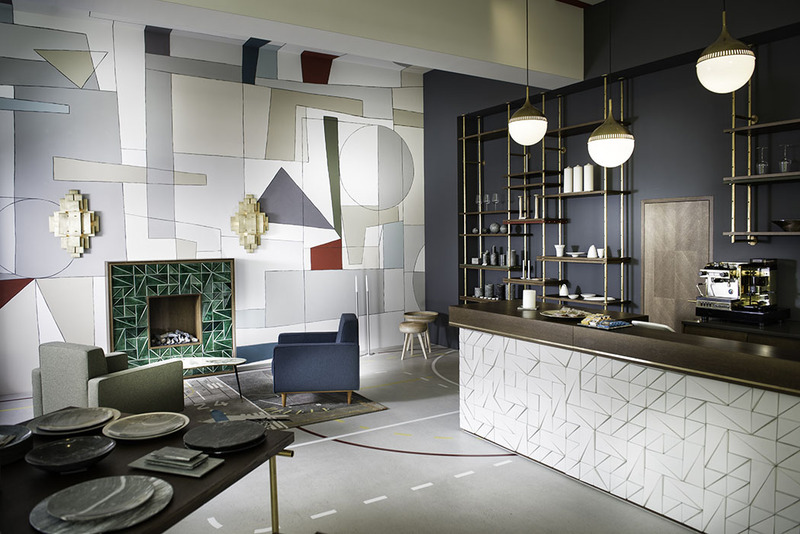 Strolling through the subtly lit lobby decorated in restful shades of blue and black, we wafted straight up to be checked-in in our fourth floor suite. On the way, we encountered the butler who offered to unpack our cases for us. The view through the huge picture windows continued the dreamy tone of our adventure. As we watched the electrically operated windows slowly open, we had to laugh at the quintessentially Swiss sounds of cowbells and alpenhorns playing across the valley. It was a simply unbelievably beautiful scene which improved further when the room service trolley arrived a few moments later with complimentary vintage Pol Roger Champagne accompanied by canapés tailored to our special dietary requirements. The rosti with caviar was superb and complimented the bubbly perfectly. I doubt there has ever been a better arrival and transition experience at any hotel in the world. As you would expect, the suite included every conceivable convenience from fluffy gowns and slippers perfect for schlepping around the spa in, in-room safe large enough for three laptops, cameras and all the usual essential stuff we cart around with us. A huge wet-room style shower with Aesop toiletries, twin washstands, top of the range Toto Washlet toilet, massive comfy sofas, wonderful flower displays, two iPads (one for surfing the internet, the other controls the room!). The electrically operated bed was an unexpected feature. At touch of a button it folds itself slowly into a sitting position for reading. Want your feet up a little higher, just toggle the button on the bedside remote control. Sheer indulgence. The wi-fi was superfast as is usual in Switzerland. The mini-bar was stocked with a sensible range of complimentary soft drinks and snacks. We enjoyed sitting out on our expansive terrace, sipping the delicious bubbles and anticipating dinner, though before eating, we needed to do some serious unwinding in that spa. 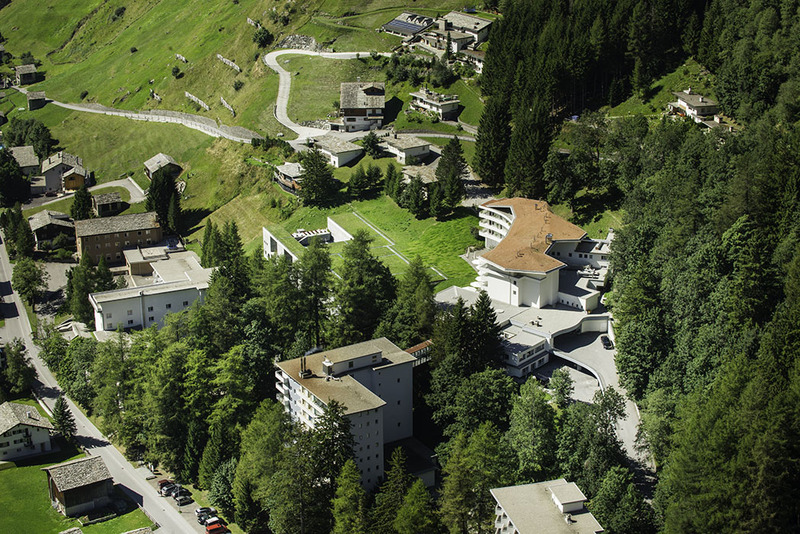 The spa building is rectangular and built from 60,000 blocks of quartzite from the Vals valley. 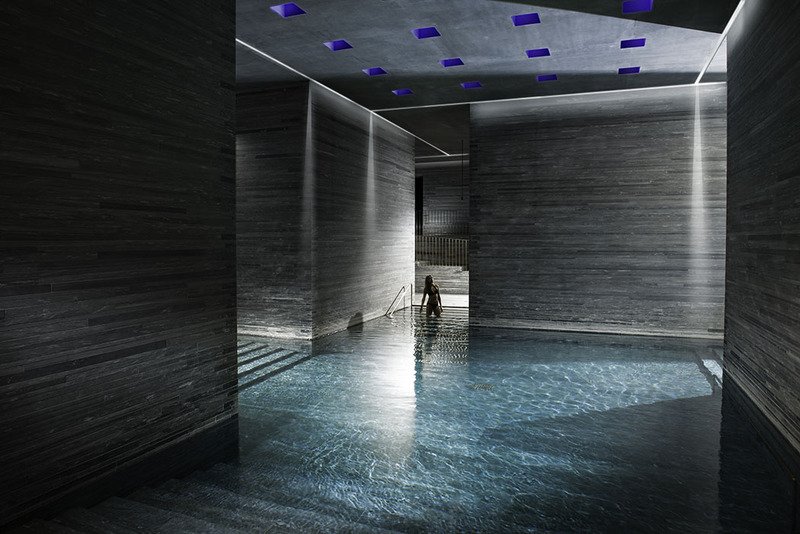 Peter Zumthor’s design won the most prestigious architectural award in Switzerland in 2010 and suits the local material perfectly creating a wonderful labyrinth of pools and hidden spaces where the water is kept at different temperatures. Some of the small rooms work as reverberation chambers and it is really hard to resist gently humming to set the walls singing. 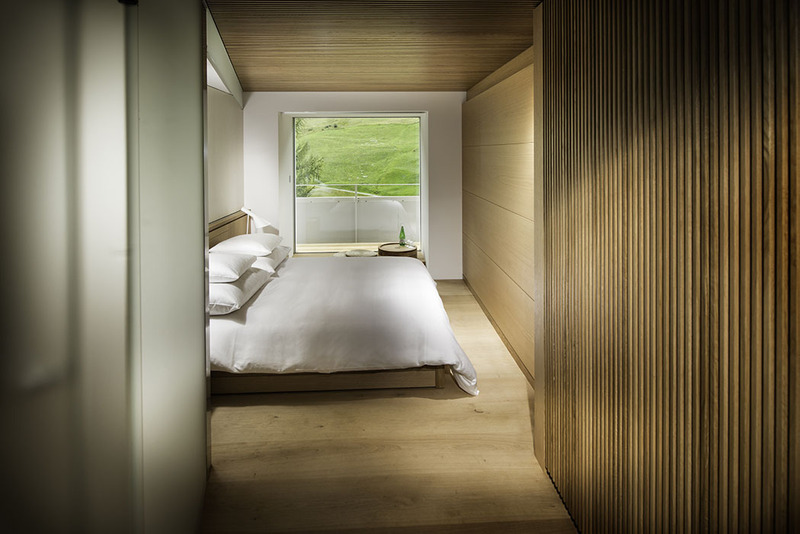 There are steam rooms aplenty, including one set for naked use and several differently styled relaxation areas, some of which have views of the valley. The centre piece of course is the outside pool surrounded by high walls with gaps strategically placed to frame the view. The outdoor pool is heated to 36C in winter and 30C in summer. We went early on our first morning at 7132 to swim in the mists created by the warm water in the cold mountain air. Simply divine and the perfect prelude to a wonderful breakfast in red restaurant. First though to that gorgeous shower and dinner in Silver. As we can eat no beef or dairy produce and one of us is gluten intolerant, we had an individually crafted six course menu with wine pairings agreed with the English Sommelier at each course. Her knowledge was incredible and she had sourced some very fine wines from a variety of small estates.We tasted local Pinot, French Meursault and an unfortified sherry wine from Jerez. Meanwhile, the poached char from just up the valley was superb in a surprising Shoyu Dashi jus. We were wowed by Bündner mountain potatoes with their waxy texture and earthy scent. Breton turbot, succulent local venison, grapefruit sorbet with barrel aged Negroni came and went in a blur of pleasure and conversation. Everything was fabulously presented and service was perfect. If only I lived closer I would be a regular. After dinner, we relaxed in the huge sunken bath, breathing in the crisp mountain air, before spending the night under our cosseting duvet with the large windows drawn open. Breakfast next morning in Red restaurant was equally delightful. From some of the best fresh fruits we have ever eaten, through the uniquely inventive do-it-yourself muesli blender, local honeys, home made preserves (we took home two jars of the rhubarb jam), omelettes done to a T and the staff really understood the importance of the provenance of the food. They had so many stories to tell about the ingredients on display. All too soon it was time to meet our chauffeur and head back to the landing ground for our helicopter journey back to Basel. 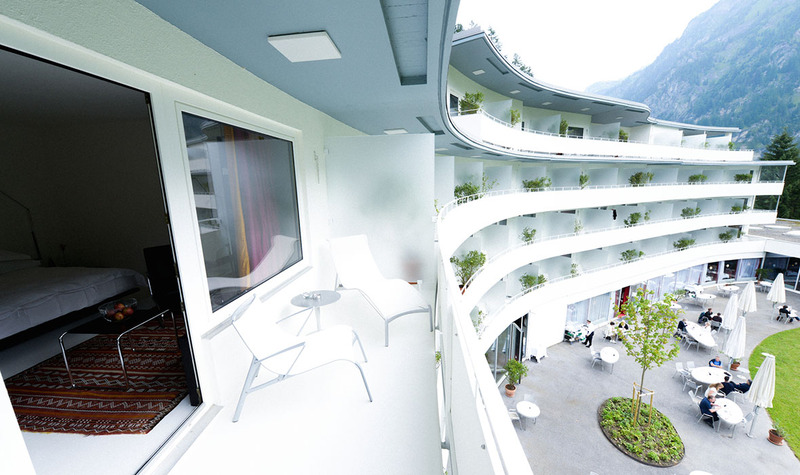 7132 takes its name from the postcode (Postleitzahl in German) and it is undoubtedly the most significant place in this tiny alpine town of 1,000 inhabitants. 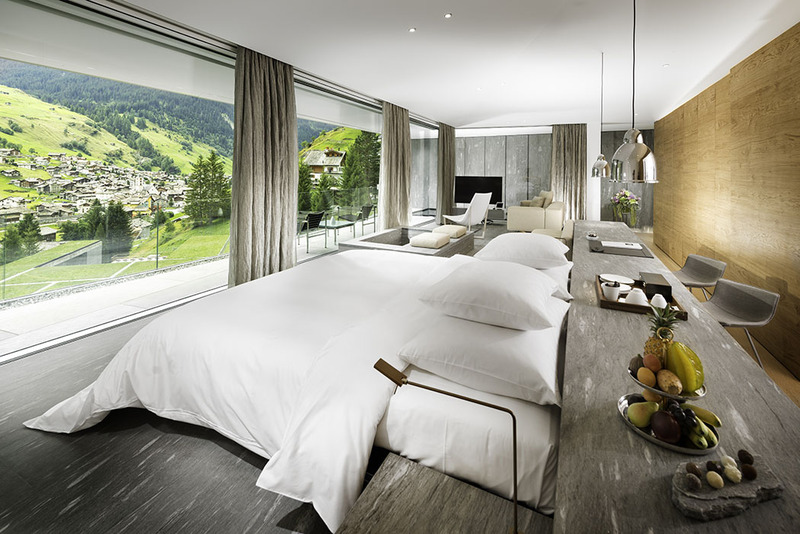 There are also said to be 1,000 sheep on the hills and 1,000 hotel rooms in Vals. Tucked away in a deep river valley at about 4,000 feet and just a few miles from the border with Italy, Vals is equally popular for summer hiking as for winter sports but justly famous for the natural hot springs. 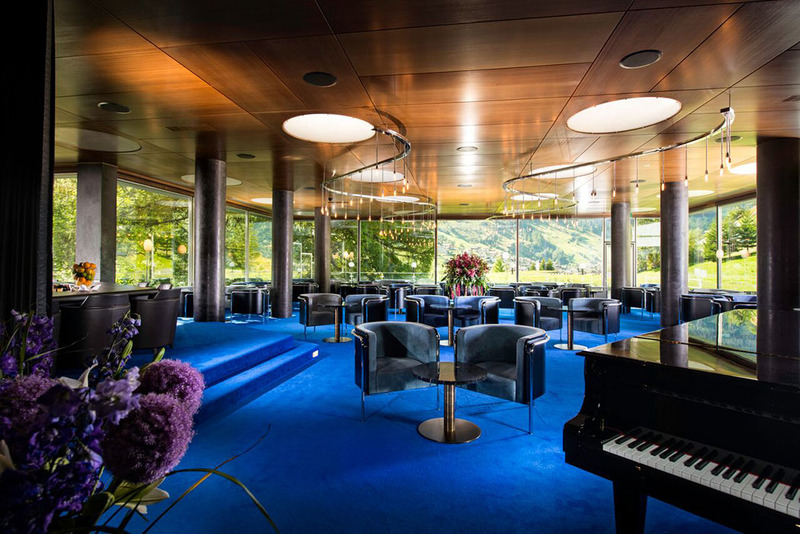 The current owner who is a native Valser has great ambitions to make 7132 one of the top 5 hotels in the world. 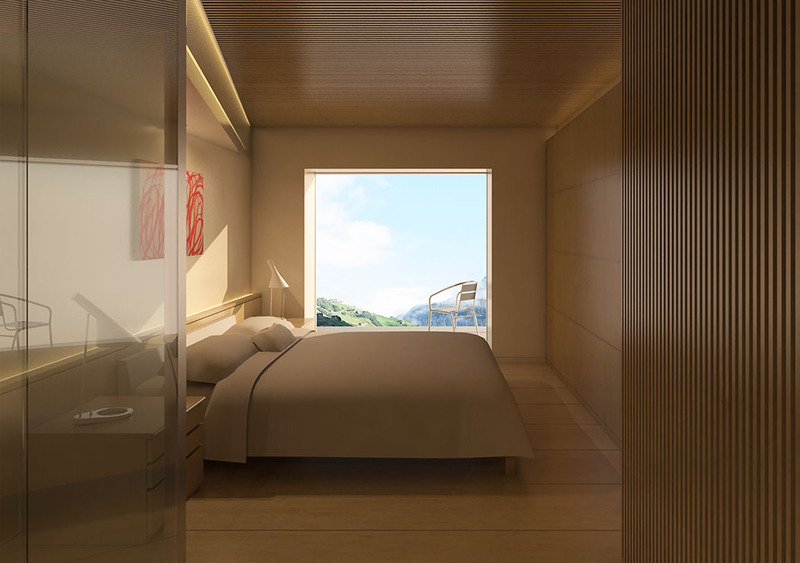 This would involve the construction of Switzerland’s tallest building within the footprint of the present hotel complex. It is a somewhat controversial proposal and a decision on the planning application is due very soon. 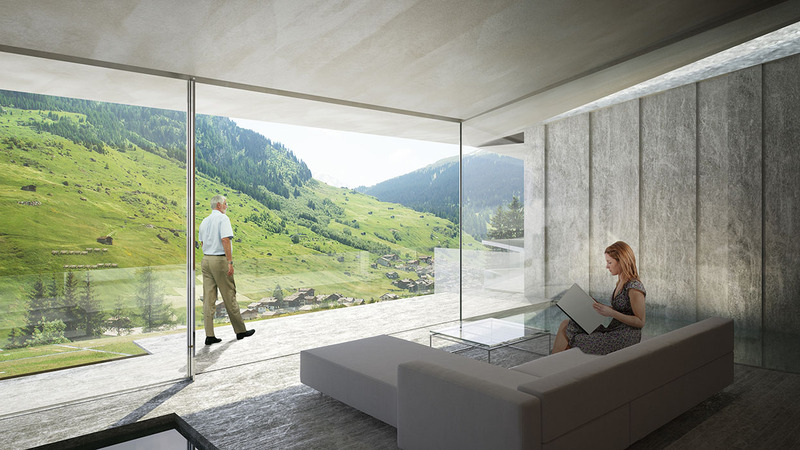 The architect’s drawing we have seen show a beautiful slim tower which seems to blend into the surrounding air by capturing and reflecting shards of light from the surrounding hills. Whether or not the tower is built, 7132 is a superb centre of excellence in hospitality in a country which has long led the world in hotel management. 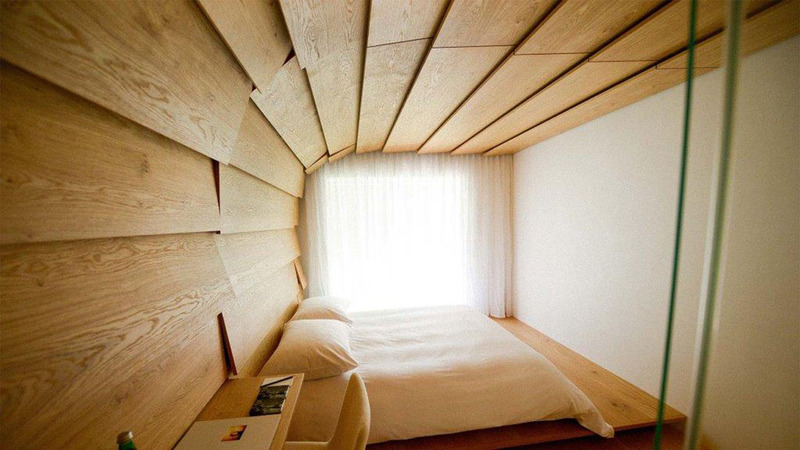 This is the perfect hideaway for stressed execs and a wonderful place to recharge the soul. We will be back and even at £1700 for a night in the suite (inclusive of helicopter and limousine transfers) it felt good value. Review by my friend Andrew Price at Driven2Travel.